Sometimes a true gem will turn up among the pages of boring WWI eBay listings. 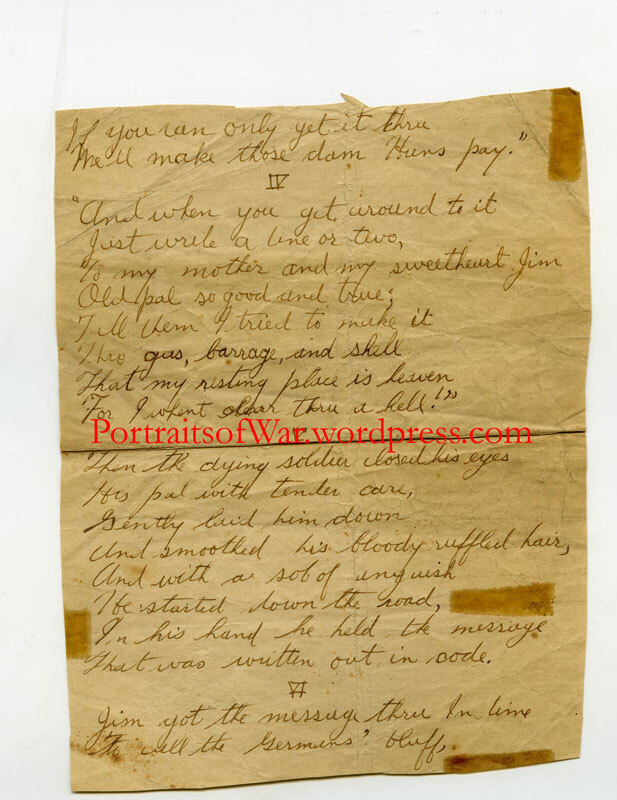 In this case I was able to purchase a small lot of photos and letters for less than $10, and discovered an amazing field written poem by a battalion runner in the 103rd Infantry Regiment of the 26th “Yankee Division” (my favorite division BTW). 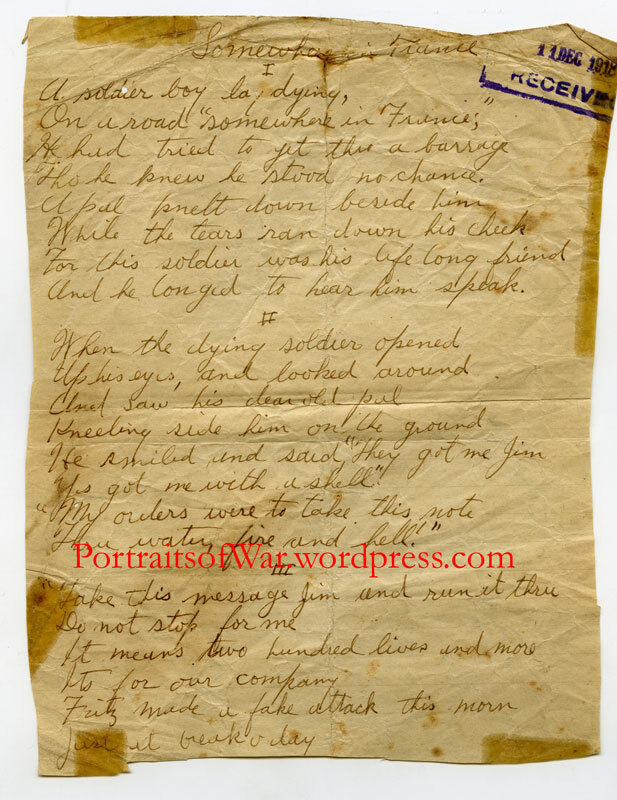 Although the photos that came with the grouping are unrelated to the 103rd, I thought I would post the poem and transcription as a memorial to all those who died in the trenches of France. Memorial Day is only a few days away and I think it is a fitting tribute to the men and women who served during the First World War. 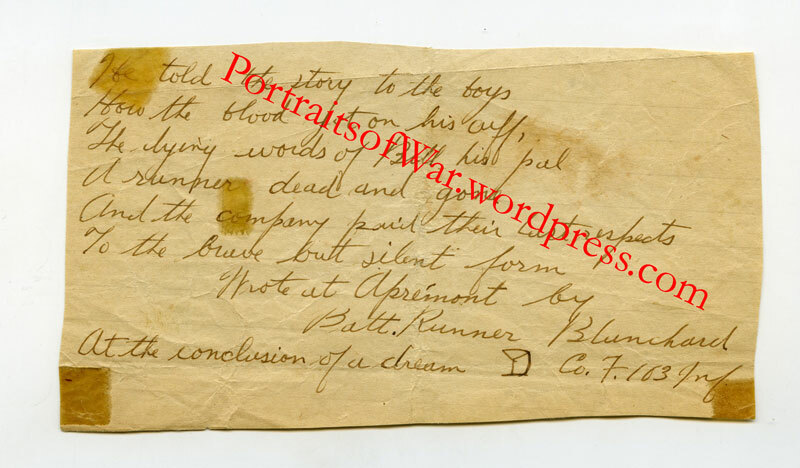 Please visit Soldier’s Mail for other photos and interpretations of further 103rd Infantry Regiment related material. Tho he knew he stood no chance. And he longed to hear him speak. That was written out in code. To the brave but silent form. At the conclusion of a dream – YD Co. F 103. Inf. This is fantastic. I would like to add it as a page on my Blog and have also linked to yours. Happy Memorial Day, lest we forget. There is a picture of company F on my website now. The roster does have a Private Blanchard, but the initials are different. Could also be Charles F. Blanchard, MG Company, 103rd Infantry, from Hampden, Maine, who was a CPL at the time of Apremont. Was wounded in action in the gas attack on May 10. However, his service card does not show any time in Company F. Still, as fluid as things were, he could’ve been detailed there while in the Toul Sector. 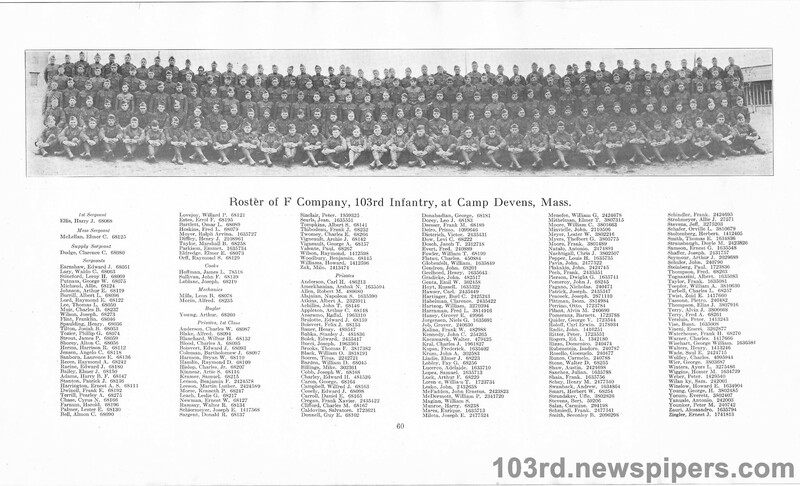 Interestingly, there’s also a Charles F. Blanchard listed in the list of men from the 1st New Hampshire who were transferred to the 103rd in 1917, from Nashua. Interesting puzzle.